What Should You Eat With a Cold & Sore Throat? Good nutrition does not just affect the exterior of your body. A steady supply of minerals, vitamins and antioxidants help keep your immune system strong and healthy as well. Several foods can help ease a sore throat and cold as well as fight off the infection causing your symptoms. Soups and warm liquids can help soothe soreness in the throat and loosen up congestion. Warm fluids like soup also help thin out mucus, which can help relieve a stuffy nose and congestion. 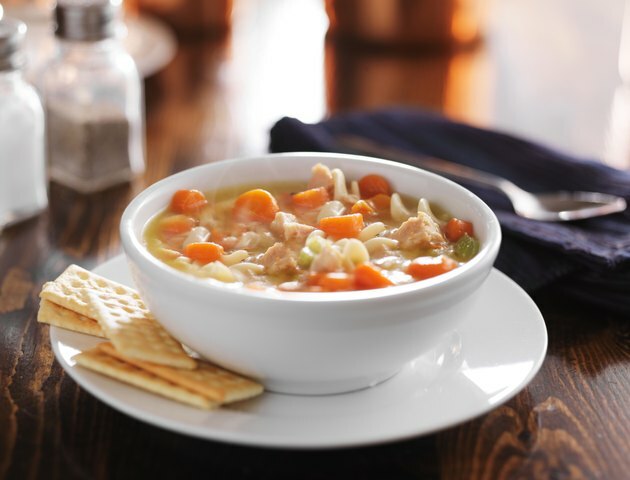 According to a study in "Chest" in 2000, chicken noodle soup in particular is anti-inflammatory, which means that it can reduce the severity of your cold symptoms. If you don't like chicken noodle soup, you can sip on any broth-based soup as long as it's not too high in fat or sodium. Seafood such as oysters, crab, clams, mussels and lobster are all high in zinc. Zinc helps increase the function of the T cells, which are responsible for fighting off illnesses like a cold. A zinc deficiency, even a mild one, can weaken your immune system and make you more susceptible to illness. Make a salad combining several types of seafood or whip up a seafood gumbo using lobster, crab and oysters. Citrus fruits like oranges, grapefruit, lemons and limes are high in vitamin C. Although vitamin C does not help to prevent a cold, a study in the Cochrane Database of Systematic Reviews in 2000 revealed that vitamin C can help reduce the duration of cold symptoms. Cook chicken breasts in a slow cooker along with lemon and orange slices or broil grapefruit and top it with banana slices for a nutritious breakfast. Red peppers are also high in vitamin C -- just one medium red pepper has about 150 milligrams of vitamin C, which is more than the recommended daily amount. Add chopped red peppers to fajitas, or remove the top of the pepper and stuff the cavity with rice, onions and seasonings. Don't be afraid to add flavorings and seasonings to your meals when you have a sore throat and cold. Seasonings like garlic can actually help reduce the severity of cold symptoms and can even reduce the amount of time you are sick. Add garlic to chicken soup or sauté it with vegetables. Tumeric is another cold-fighting spice, containing anti-inflammatory properties that can help ease pain and swelling in the nose and throat. Add turmeric to your favorite stew, sprinkle it on fish or put it in a casserole.